Reagan Nehemiah, our new little addition to the family. 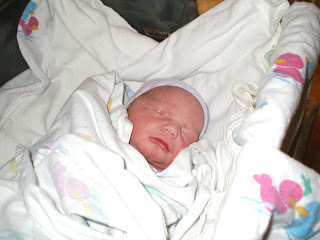 Welcome to the world, little man. Your arrival was fast and furious and to my dismay, unplanned. God has been doing a number on me lately, with little reminders of his sovereignty and then you coming along, like you did, was a big reminder. O.k. God, I get it- I relinquish my control. The drama ensued with me waking up at 2am with a terrible pain and a little "pop" (hmmm.....did my water break?) As I tried to make my way to the bathroom, I was conflicted with the realization that it could be happening like this. So quick? The contractions only minutes apart? Do I really need to push? 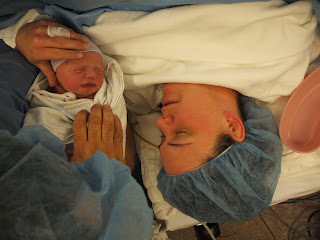 As I woke up your daddy (3times) I could barely move or talk and the calm approach I thought I'd have, after being in labor twice before and knowing how to do it, went out the window. I was panicked. And worried. How was my uterus holding up. Would we make it? Oh and by the way- I wasn't supposed to do this labor thing again!!! Ugh. I can remember griping about this as I made my way to the car. Thankfully, your daddy had been through this before and knocked the sense into me, driving 95 miles/hr getting me to the hospital in the nick of time. Having connections, one of my co-workers was waiting for me at the curb with a wheelchair and whisked me to labor and delivery. My awesome pals and co-workers moved swiftly and you graced us with your presence 45 min. later, by cesarean. Your daddy made the call, "IT'S A BOY!" and our hearts were moved once more as we welcomed another life into our family. From the moment you arrived, you have been such a gift. As you were handed to me in the delivery room, your sweet smell was implanted in my memory. You were a true example of innocence and purity, and you were ours. The realization at that moment, that your every need depends on me and your daddy is profound and humbling. You and I got to spend a few hours together before you were reevaluated in the nursery. Unfortunately, you weren't feeling well and you had to be transferred to the NICU for treatment of infection and rapid breathing. I felt a great disappointment b/c I knew the course of treatment would be at least a few days and that you probably would have to be away from me most of the time. The first few days at the hospital were spent trying to rest in between frequent visits to the NICU, to see you. You were receiving iv fluids, so you weren't that hungry but I tried to nurse you when possible. Managing on limited amount of sleep and being sore, made it difficult to cope at times. But, you had really good nurses taking care of you and they encouraged me along the way. I was also very blessed to be able to stay with you all week, while you stayed and completed your antibiotics. Once I was discharged on Tues. I stayed with you all day and went home to see your brothers for dinner and bedtime, and then I made it back in time to feed you and sleep with you all night. There was a room with a cot available for such a need. The week became very long with traveling back and forth and I missed your daddy and brothers. But, daddy helped keep me going and did a great job taking care of things at the house. 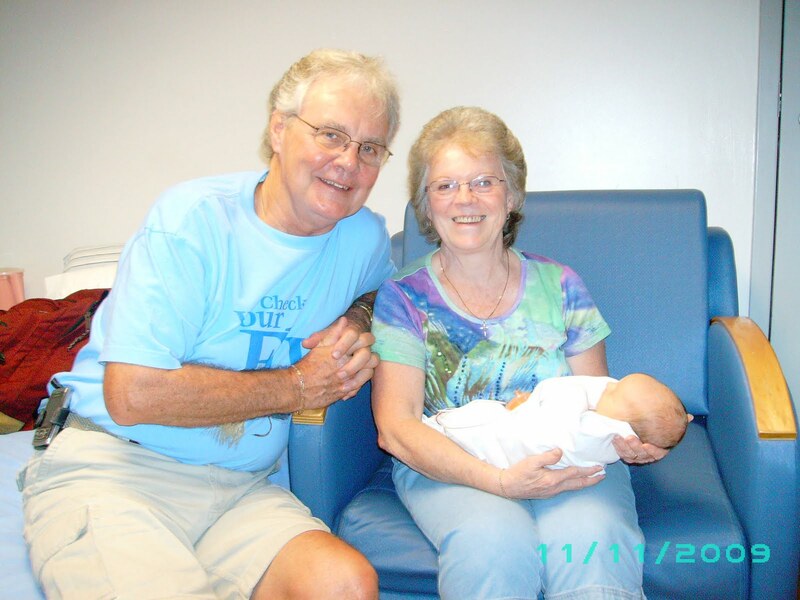 Grandma and Papa Stalnaker came to visit you the first day and helped at the house too. Each day you did a little better. Your breathing slowed down, you usually pulled your tube off your face that was supposed to give you oxygen; and you started getting hungry. 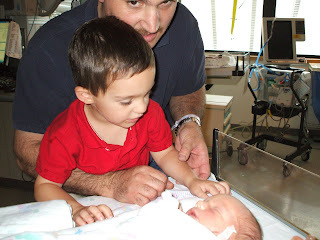 After Tues. you were moved to the NICU 2 and basically hanging out like a "normal" baby. Spending time with you in the unit gave me a new perspective and greater appreciation for families that had babies that had to stay long term. I saw many moms that I recognized as previous patients and realized that their baby had spent a long time at the hospital already. Many families appeared to have been "visitors" for many months. Their child too big for a bassinet and now moved to a bigger crib with activity toys and all, was a true picture of how long they had been there. I empathized with them, especially knowing that you were coming home in a week. I reminded myself everyday as I watched others to be very, very thankful. We made it through your first week of life. Not as expected, but blessed even still. You successfully completed your antibiotic regimen and Sat. morning you were officially discharged. I could barely wait to get you in the car. I wanted to have you in the comfort of our home and spend time with your daddy and brothers. Unconventionally, you and I left together, no daddy or wheelchair and entourage at our side- just you and me. It was a strange departure, yet glorious and I said to you, 'here we go baby, just you and me'. 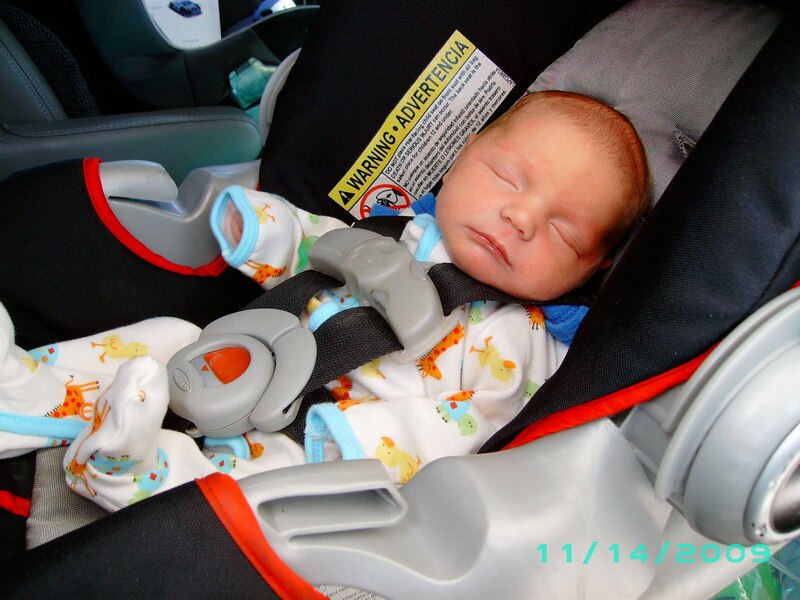 You slept peacefully the whole way home on your first car ride. YEAH little Borges #3!!! He is already a blessing and is blessed to be born to such a wonderful family. Hope you guys are doing...well...doing. I'll call you this week. Love the pictures, looking forward to some more, the next time you aren't feeding one, chasing the other two, sleeping or trying to catch up on everything else and have time to post some! Hope you all are doing well.. we should be there Tues night with a meal.. email me if you are hungry for anything in particular! Ahhh...so sweet. I cant wait to see him grow up - not too quickly of course! He'll have so much fun with his brothers. I hope to see you all soon.